We live in a world where the majority of people have smart phones and the iPhone is one of the top choices of the people. As a matter of fact I am an Apple Fan Girl and absolutely love my iPhone & iPad. You’d be hard pressed to get me to trade it for something else. But it isn’t just the fact that the device is awesome, it’s the apps that really make it fun. I love finding new apps and what I love even more is when they’re free (I’m cheap…) and on occasion you can find the paid for apps free for a short time too. So what are my favorites? 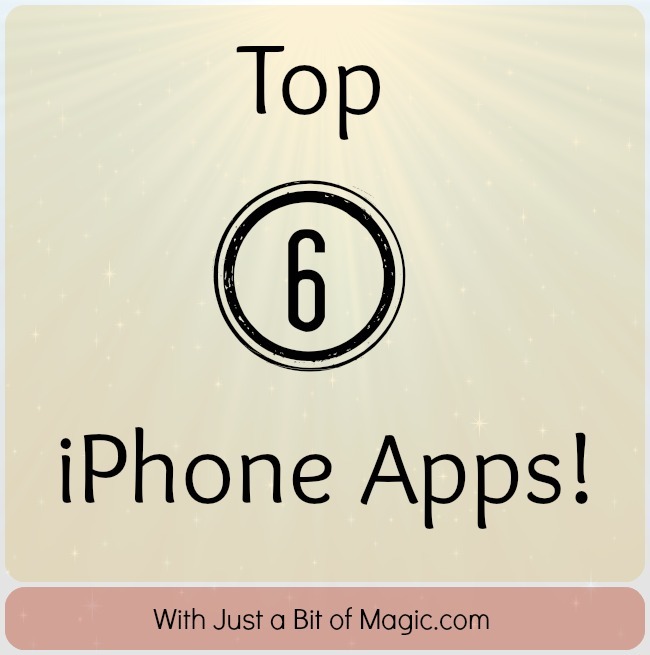 What are the top 6 iPhone apps that I think everyone should have? Keep reading! I should let you know that these are in no particular order. I love them all equally and narrowing it down to just 6 apps that I adore is hard! I spent a lot of time looking at my phone and iPad trying to decide which ones made the list. Find my phone – I don’t know how many times my son has taken my phone and set it down somewhere and I can’t find it. I call it but it’s on silent, I ask him and he doesn’t know, and I’m left to search the entire house until I find it. This handy app eliminates all the searching. All you have to do is sign in on another iOS device with your Apple id and you can locate your phone, remotely lock your device, erase personal data, and more. Instagram – I think that just about everyone knows what this app is. I love it though! I can share images from my life… my kids, my work, my travels, and of course my food. With filters and frames I can make my pictures look awesome. What I really like though is that it gives us a glimpse into our friends lives and the world around them. Snapseed – This app is awesome for editing photos that you’ve taken with your iPhone. It took me a while to really figure out and how best to use it but once I did… wow! I had a couple amazing pictures and there was even one that a friend thought a professional photographer took. Feedly – With Google Reader gone I’ve had to find another to keep up with all of my favorite blogs and Feedly is awesome for it! Netflix – I have this app on every single device whether it’s iOS or not! I love to be able to watch some of my favorite shows even when everyone else is watching something else. It’s also handy to keep littles ones occupied when you’re out shopping or in the waiting room at the doctor’s office. 8tracks radio – I love this new way to listen to music and best of all it’s ad free (when listening there are some on the screen)! You select the type of music, mood, feeling, or whatever and then it’ll give you mixes based on those. You can also create your own mixes. I haven’t created one yet because there are so many others that I like that I don’t have the need yet! There you have it! 6 awesome iPhone apps that you must check out for your iOS device. Oh… and probably your Android too. It’s Thursday and for something a little different and fun I’m linking up with Mama Kat for her Writer’s Workshop.